When it comes to making herbal preparations, one of the simplest ways to go about it is to use the folk method. The folk method is often used by beginner herbalists because it’s a simple and easy method to follow, but that doesn’t mean it’s for beginners only. Many experienced herbalists continue to prefer this method of herbal preparation, especially those that tend to rely on their instincts when working with herbs. In this post, I’d like to explain what the folk method is, discuss the differences between it and ratio method, and walk you through the steps of making an herbal preparation using the folk method. What Is The Folk Method? The folk method is one of the simplest ways to make herbal preparations. As its name implies, it’s what the common “folks” would use. The folk method is simple and easy. There is no difficult math involved, you use what you have on hand, and no extra equipment is needed. As you grow as an herbalist, you will eventually rely on your instinct and knowledge to craft the folk preparations you’re going to use. While many people may think the folk method is not of high quality because it’s too simple, this is simply not true. 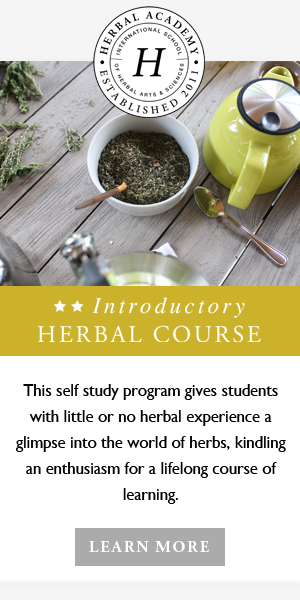 Many well-known and well-respected herbalists prefer using the folk method because of its simplicity and the intuition it takes to use it. “… simpler referred to someone who was observant and relied on intuition and an inner knowing for making preparations” (Gladstar, 2008, p. 378). As with most things, there are pros and cons of each method. Your preference and situation will determine which you will use. Like I mentioned earlier, the folk method requires no exact measurements. You can follow a recipe that uses roughly estimated parts, or you use your knowledge, experience, and intuition to judge how much of an herb to use in your preparation. With this method, it’s rare that any two preparations will turn out the same. When it comes to determining dosages for preparations made using the folk method, again, your knowledge and intuition will come into play. Most times, though, dosages are titrated up or down based on the situation you’re dealing with. The ratio method, on the other hand, uses exact measurements of herbs and solvents. Oftentimes, a specific amount of herb is weighed and a certain volume of solvent is measured. This is then combined, and the result will be consistent each time you make it. Dosage suggestions are based on the strength of the herb and the herb to solvent ratio. Stronger preparations will have smaller dosage recommendations while weaker preparations will have larger dosages. Again, there are benefits to each method, and one is not better than the other. To show some preparations made using the folk method, let’s look at three recipes below. Let me encourage you to try these out for yourself so you can familiarize yourself with this method. This infused oil is one of the simplest herbal preparations you’ll ever make. It’s made with the wonderful herb, calendula, using the folk method. It can be used as is on the skin or added to other herbal recipes like this simple Calendula Salve. In a clean, dry pint jar, place enough dried calendula flowers to fill jar 1/3 of the way full. Cover the herbs with carrier oil of your choice, filling the jar to 1 inch from the top. Stir the mixture with a clean, dry spoon, screw on a tight lid, and allow it to sit in a dark, warm spot. Shake every couple days for good measure. Strain the mixture after 4-6 weeks and store in a clean, labeled glass jar. This preparation comes from our blog post on how to make oxymels, and it shows a traditional oxymel preparation made using the folk method. As you can see from the recipe below, you have no specific measurements, only parts. Therefore, when combining the ingredients, you eyeball the amount of each as you put it in your jar. In a clean, dry pint jar, place enough dried herb to fill 1/4 of the way full. Store the jar in a dark, cool place and shake every couple of days. Another recipe made using the folk method is this one for Cumin, Coriander, and Fennel Seed tea. This tea is perfect to benefit digestion during the colder months of the year when we tend to eat heavier foods. This recipe is made using equal parts of herbs. It’s also easy to make in bulk and use whenever you need a digestive boost! Mix all dry ingredients together and add to a glass mug. Cover with 2 cups (16 ounces) of just-boiled water and steep for 20 minutes. Sip this tea before or after meals to promote healthy digestion. Gladstar, R. (2008). Herbal recipes for vibrant health. North Adams, MA: Story Publishing.